The Wildcat represents many hours of complex design and systems testing. The end result has exceeded expectations for a compact, high power, and high accuracy performer. Features include a precise air regulator and new magazine system that is easy to load. The Wildcat valve system is powered by the new high grade aluminum air cylinder that sports a durable new tactical finish. Many hours of labor have gone into this new finger print resistant finish. The cocking lever has been engineered to be the smoothest operating possible with only the highest quality materials used. Forward placement of the charging lever the provides the quickest and most simple actuation. The joy of cocking and firing this new air rifle is only surpassed by the results found on the target. Utilizing the match winning Smooth Twist barrel, .5 inch groups at 50 yards are common. The action is nestled into a durable synthetic stock with soft touch coating for all weather comfort. This new stock comes to point quickly and with the new scope rail design places the shooters eye in a comfortable and proper position to eliminate parallax error. The Wildcat represents a new era in quality and design for FX. 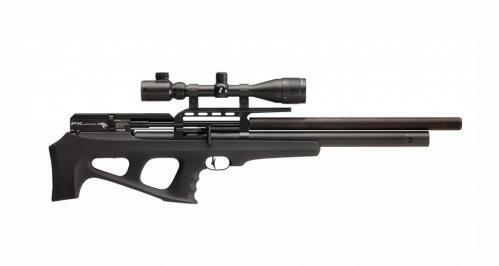 This compact powerhouse will excite the Bullpup and tactical customer as well as perform as a full length gun for the more traditional shooter.